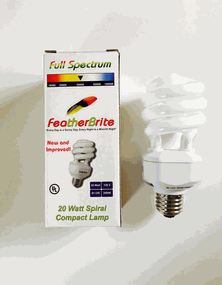 The importance of full spectrum light is in providing a balanced spectrum and regular photoperiod for your bird. Experts in lighting for parrots recommend 4 hours of full spectrum lighting with 8 hours of normal light, balanced by a period of darkness of approximately 12 hours in a 24 hour cycle. The featherbrite bulb simulates the UV spectrum of light that your parrot would enjoy in the wild. 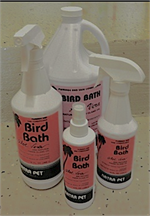 Your bird uses this light to set its internal clock, regulate its endocrine system and metabolism, decide when and how attractively to feather, ward off disease and remain generally health and happy. 10 % DISCOUNT APPLIED AT CHECKOUT.